At creation, God blessed and hallowed one day in seven to be devoted to his worship – the Sabbath Day. After the resurrection of Christ, this became the Lord’s Day, the Christian Sabbath. What does the Bible teach us about the Lord’s Day? How is the Lord’s Day to be remembered? How is the Lord’s Day to be kept holy? 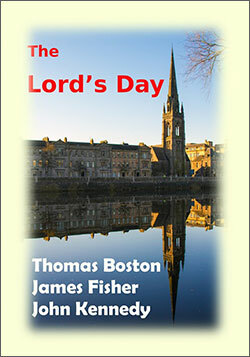 This book contains articles by Thomas Boston of Ettrick, James Fisher of Glasgow and Dr John Kennedy of Dingwall. For customers outside the UK: available on [clickable button – Buy from amazon.com] – I don’t yet have a link but will provide that once the book is “live”. E-book. For UK customers: available on [clickable button – Buy from amazon.co.uk] – I don’t yet have a link but will provide that once the e-book is “live”. For customers outside the UK: available on [clickable button – Buy from amazon.com] – I don’t yet have a link but will provide that once the e- book is “live”.